Jenny Helling Fuller | Fafinski Mark & Johnson, P.A. 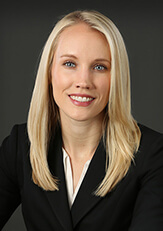 Jenny Helling Fuller is an Associate in FMJ’s HR & Employment and Litigation practice groups. She handles a variety of employment and business-related matters, including employment advising and risk management, as well as employment and commercial litigation. Jenny is an advocate for her clients and understands that trust is a necessary part of effective client relationships. In order to cultivate these types of client relationships, Jenny clearly and consistently communicates with her clients. In addition, she takes the time to listen to her clients and master the complexity of each business or individual situation. Prior to joining FMJ, Jenny was an associate attorney at a boutique employment firm. She litigated employment claims involving issues of discrimination, harassment, retaliation, wage and hour, whistleblower, FMLA, fraud, and defamation. She also has experience with contract, breach of fiduciary duty, and minority shareholder disputes, and has defended employees from non-compete and trade secret claims. Jenny likes to be active and be outdoors. She and her family usually spend weekends on their road bikes as it allows them to explore parts of Minnesota they might not otherwise see. She is also an avid runner and enjoys the challenge of training for races.